I love, love, LOVE being part of What I Ate Wednesday hosted by Jenn at Peas & Crayons. It is such fun to be part of something that brings so many people from all over together with one purpose…to share the food they’ve eaten. I like it so much that I’ve even joined in on weeks when I’ve had no food photos to share. That may be cheating, but I Talked about food, isn’t that sufficient?! 😉 Because of the fact that I’ve actually done this with No food photos, I guess I can’t be embarrassed about posting when I don’t have many photos. I decided to use the WIAW logo that has the photos so I’d be showing just a little more food. Oh, who really cares…I just want to be part of the party! My lack of food photos is based on two things. Refrigerator issues that have forced me to have very little food in the house. Meals that were so quickly put together and consumed that I would afterwards say…Phooey…I was supposed to take a picture of that! And the fact that Ralph and I were away over the weekend with a group of people who really would have been confused if I whipped out my camera and started taking food pictures. It’s a shame because the food was pretty good. There is one from the weekend. Ralph and I were off on a short road trip to one of his military reunions. We got a little bit turned around in our directions and weren’t sure where our next turn should be. When in doubt, stop at a diner! We did that and since breakfast had been pretty early, we were hungry but didn’t want too much to eat. We both opted for a toasted bagel with cream cheese and jelly, coffee too of course. It was all pretty tasty and kept us full until later. We got our directions and we were even led out of the diner to the right direction by some other customers who heard us asking the waitress for directions. Such nice people! The other issue we were dealing with was that my car was in the shop most of last week. Ralph’s is also not doing too well, so we were limited in our transportation. We were finally able to pick up the car and knowing our food limitations at home, we headed to the local pizzeria. It’s actually within walking distance if we’d needed to get there without a car. Anyway…I opted for my usual. 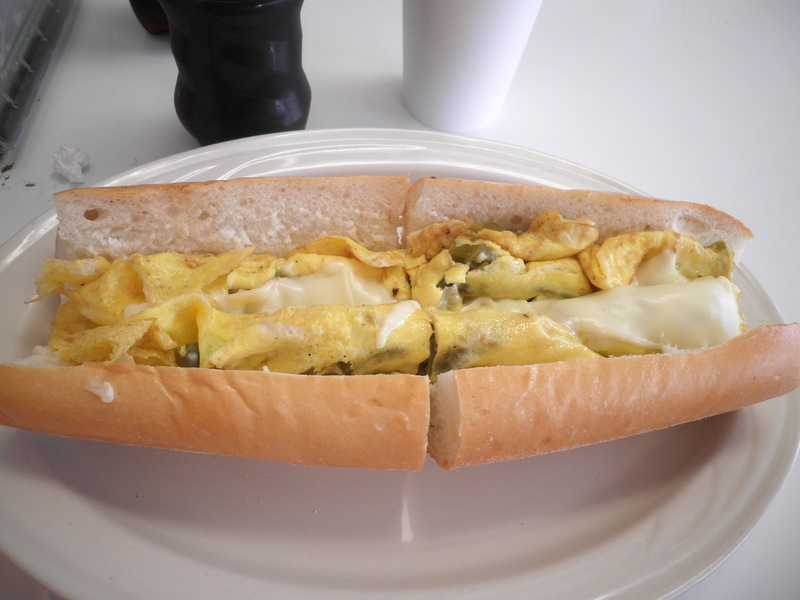 Pepper and egg sandwich with American cheese. This is so good and so filling that I was set for the evening. So having picked up my car, my first trip out in my newly repaired car (she purrs like a kitten now!) 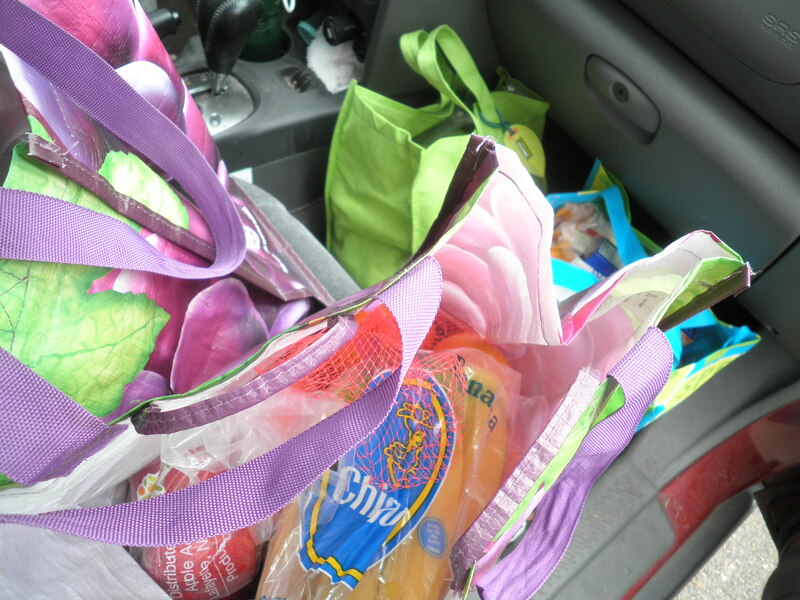 was to Verchio’s produce market and to Aldi. Car chock full of goodies!! I quickly consumed an apple too quick to take a photo and a banana. 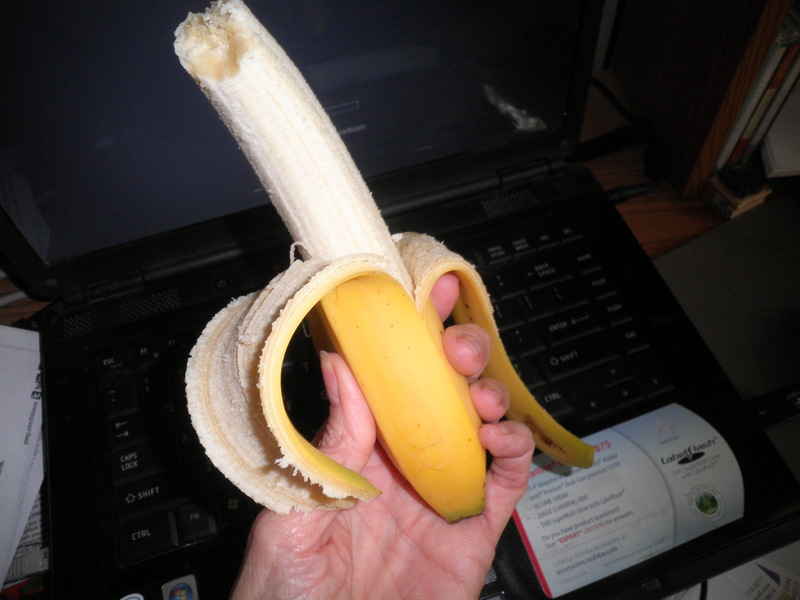 Ok…so there’s really no GOOD way to photograph a banana. I did it as I was turning on the computer to finish this post. It was delicious and I’m SO happy to have fruit in the house again. It has become my go to snack anytime of day and I’m sure it’s been helpful in keeping me on track with Weight Watchers. So that’s it for What I Ate Wednesday this week for me. Now that I’m back in the swing of things, I’ll have many more photos for you next week. Be sure to stop over at Peas & Crayons…you’ll find Lots of food photos there! Don’t forget to leave some comments. This entry was posted in Uncategorized and tagged fruit, Weight Watchers, WIAW. Bookmark the permalink. “when in doubt, stop at a diner.” -> that sentence made me laugh, fran! glad you have your car back and your groceries done. yea for fruit! Glad you like it, Cath, but it’s true!! Someone in there HAS to know how to get there…it never fails! Besides, there’s coffee in there! Feeling good about a lot of things now…getting things done. Yea for Fruit is right!! Sounds like getting lost turned out to be kind of nice 🙂 Looks like a fun day of eats! Thanks, Liz…it was really a great weekend! Have a good day! Thanks, Meghan! I haven’t had a bagel in ages but when Ralph suggested it, it was perfect to fill the food void at that point. Have a great day! 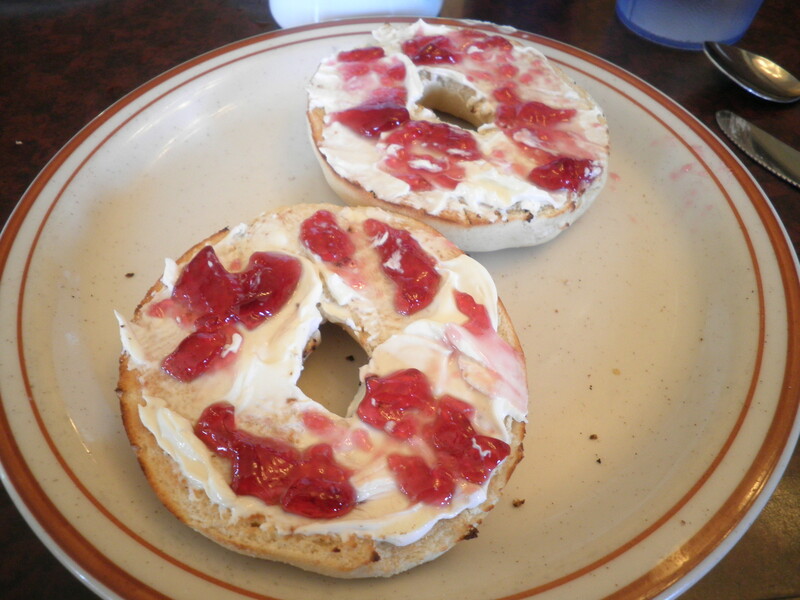 A bagel with cream cheese AND jelly sounds like a great combo. I love bagel/cream cheese/jelly…so tasty!No, it was a pretty big banana, Madison and very tasty especially since I hadn’t had a fruit in the house! Have a great day! Oh, Allie…now I want Dunkin Donuts!! They keep putting coupons in our local newspaper. They’re sitting right next to me on the desk as I type this. Maybe Ralph and I need to have a little road trip that passes a DD!! I’ll think of you! My fridge was turned off for 8 hours a few weeks ago and I was SO mad, why didn’t power company give me a heads up? Anyway, I was mid waffle making when the electricity went out, such a bummer! Marie, my issue is due to age…the fridge, not me although I think they are somehow linked! We’re making due. I think the house was built AROUND the fridge so I’m not sure we’d be able to get it out if we tried! Good reason to move to NM sooner! !